So, goes the rallying cry that finishes each non-contact Rock Steady Boxing class. The class provides both physical exercises to specifically address the difficulties faced by those with Parkinson’s disease, and a community of people fighting for the same cause. “Everybody’s in the same boat,” said John “Fast Johnny” Pistacchi. While Sill just began recently, Pistacchi has attended the class since it was first offered almost two years ago in southern San Diego. 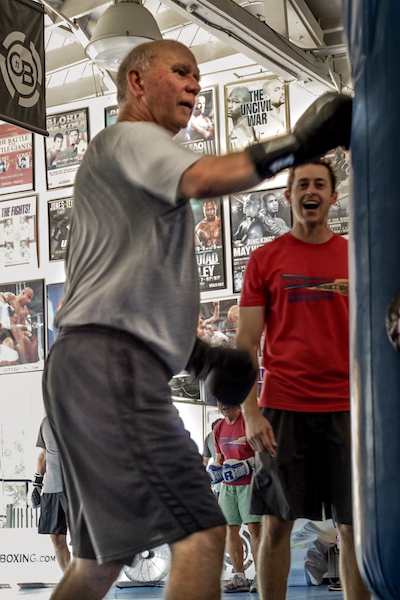 The class is held at City Boxing in downtown and hosted by BoxFit San Diego. 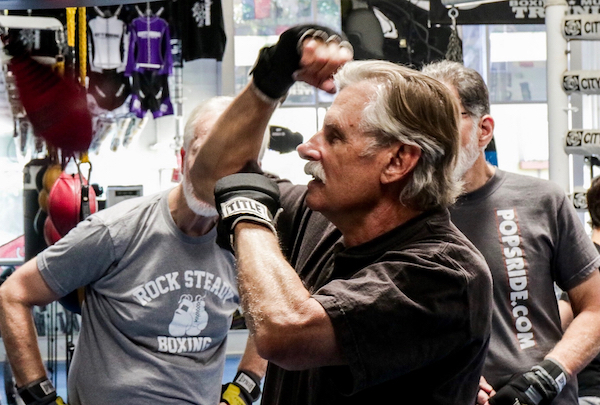 Rock Steady was started in 2006 by an Indiana prosecutor who started intense boxing training just a few years after he was diagnosed with early-onset Parkinson’s. According to the program’s bio page, the prosecutor witnessed a dramatic improvement in his physical health, agility and daily functioning. He started working to provide the program and specific training to others with Parkinson’s as well. 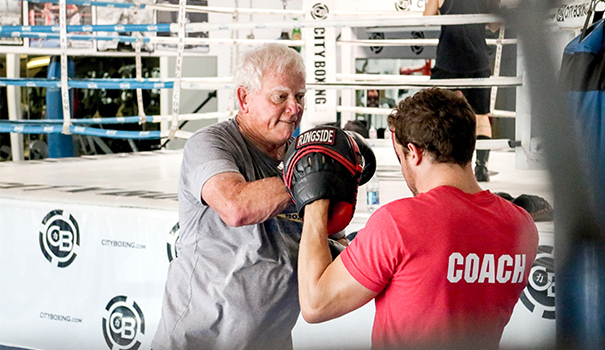 Since then, there have been studies completed by the University of Indianapolis, Butler University, and Cleveland Clinic showing the benefits of intense focused exercise, and specifically boxing training, for Parkinson’s patients. You could also just ask the Rock Steady boxers who keep coming back. Other noted victories include walkers that are no longer needed and class members being able to lift their foot and tie their shoe — a feat that fighter had no longer been able to do. Pistacchi noticed he hasn’t degraded in the last three years since he was diagnosed, and he credits Rock Steady as a “big part” of that. Mike Reeder, founder of BoxFit, which holds outdoor boxing boot camp classes, first heard about the Rock Steady program through a CBS Sunday Morning segment. The segment focused on the husband of Lesley Stahl of “60 Minutes” and his fight against the disease. It also included results of the first major study on the effects of forced intense exercise through boxing on Parkinson’s disease. When Reeder volunteered at the Rock Steady class already in Vista to check it out, he was hooked. “They were like an army of fighters,” he said. Reeder was volunteering in a 90-degree gym, without air conditioning, and he had so much fun he stayed for a second class. Even now, friends joke with him that they don’t know who enjoys the Rock Steady classes more — the Parkinson’s fighters or himself. After volunteering in Vista, Reeder connected with the Parkinson’s Association of San Diego. They were able to get him a spot at the training in Indiana … which was supposed to be a six-month waiting list. City Boxing, where he was already training, agreed to rent him the space for the daily classes. Reeder started with five class members, and now regularly averages 18-20 boxers. Some come via word of mouth, and many are recommended by their physician or therapist. The classes start with a warm-up and introductions, and then break out into stations. At the various stations, fighters do activities like shadow boxing, agility exercises, speed bags and circuit work, all set to whatever music the class wants to hear. The hour-and-a-half program closes with a cool down and meditation. While Reeder sticks to the basic Rock Steady tenements and boxing training, he does add a few of his own touches. For example, every class member gets a “boxing nickname.” Aside from the previously mentioned Mama P, Fast Johnny and Bam Bam, there’s also boxers such as Mrs. Crazy, Will Do, Captain Knockout, Dr. Steelhammer and The Beast. “I want them to know, you’re not someone with Parkinson’s, you’re a Parkinson’s fighter,” Reeder declared. The class members are ecstatic not only about the strength they feel and the camaraderie they share, but their coach specifically. They brag on his energy, patience, and understanding. For more information on becoming a boxer or volunteer, visit boxfitsd.com and click the “Rock Steady” tab. Also, on the site is information about Reeder’s boxing boot camp classes, which are open to the public and held at Morley Field and Balboa Park. You can also follow or like BoxFitSD on Instagram and Facebook. —Joyell Nevins is a local freelance writer. Reach her at joyellc@gmail.com or follow her blog “Small World, Big God” at swbgblog.wordpress.com.